Flow Hive Hybrid gives you the best of both worlds – fresh, natural honeycomb and pure, unfiltered honey on tap straight from the hive. This complete hive combines Flow technology with traditional wooden frames in the Flow Super, giving beekeepers the opportunity to experience the ease of harvesting with Flow and the ability to collect delicious honeycomb. Priced at $649.00 AUD, our Flow Hive Hybrid is our most affordable complete setup! Includes FREE Flow Veil – valued at $15! Crafted from premium Araucaria (also known as Hoop Pine) – highly regarded for its stability & durability, the Flow Hive Hybrid also includes an integrated pest management screened bottom board, observation windows and our distinctive gabled roof. The Flow Hive Hybrid is a wonderful addition to any apiary providing the potential to harvest up to 3kg of pure honey from each Flow Frame, whilst also being able to collect and enjoy honeycomb. Honeycomb is a wonderful gift for friends & family, organically built by nature’s little engineers and constructed in natural-and-perfect hexagon shapes, honeycomb is bound to entice and inspire those who you choose to share it with. With so much flexibility the Flow Hive Hybrid is one sweet hive! 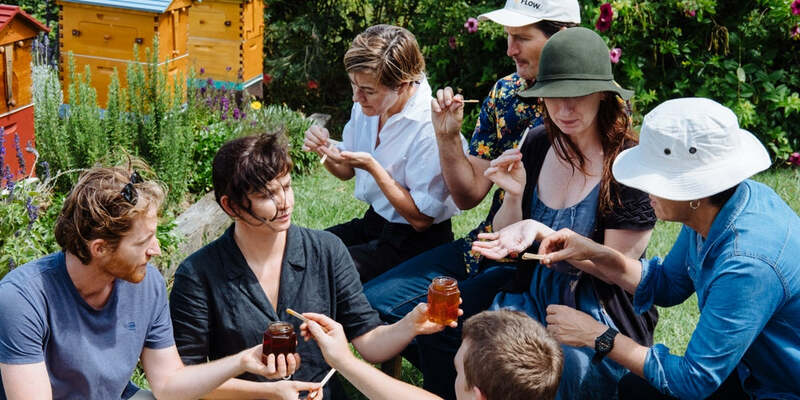 Perfect for families & children who may never have experienced the delight of fresh, warm honeycomb from bees, which–in addition to being delicious–makes a great gift for friends and neighbours. Honeycomb is enticing, children are fascinated by this sweet, sticky delicacy– also a firm favourite with gourmet food-lovers, honeycomb can be served on cheese platters, as a lush breakfast or after-dinner spread, or enjoyed on its own for its chewy sweet simplicity. Often referred to as the “Beekeeper’s Dream”, Flow was created out of a desire to make harvesting honey easier for the beekeeper and to lessen its impact on the bees. “I really didn’t like squashing bees or disturbing the hive when harvesting, so I thought ‘there has to be a better way”. (Cedar Anderson). How much honey/honeycomb does the Hybrid produce?